A constant rise in demand for healthy and nutritious product varieties, with low-calorie and sugar-free products gaining high consumer preference, and the demand for convenient snacks are some of the key trends impacting the overall development of the present-day Switzerland biscuits market. The rising numbers of international and domestic tourists in the country and steady growth in the retail sector post the economic turmoil of 2008 are aiding the market in moving along a sustainable growth path. However, rising raw material, labor, and packaging costs and the need to hold on to prices to withstand the intense competition in the market are collectively leading to a stagnant rise in profit margins for manufacturers. Transparency Market Research estimates that the Switzerland biscuits market will expand at a CAGR of 1.7% over the period between 2016 and 2024, rising from a valuation of US$973.3 mn in 2015 to US$1,125.7 mn by 2024. The market will expand at a 1.2% CAGR in terms of volume over the same period. Of the vast variety of products available in the Switzerland biscuits market, the segment of chocolate coated biscuits contributed the largest share to the market’s overall revenues in 2015. The segment acquired a 36.9% share in the market’s revenues in 2015 and is expected to reach 39.4% by 2024. Bourbon biscuits, filled biscuits, and plain biscuits were the other leading product segments in terms of their contribution to the market’s revenues in 2015. Volume-wise, the segment of plain biscuits emerged as the market’s most favored product variety, accounting for nearly 29.4% share in the market’s overall volume-wise sales in 2015. The segment is, however, expected to lose its prominence to other segments such as filled biscuits and rich tea biscuits over the forecasting horizon, with its share witnessing a meagre decline to 28.6% by 2024. The health appeal of plain biscuits will allow the segment to remain at the forefront of sales in the near future as well. 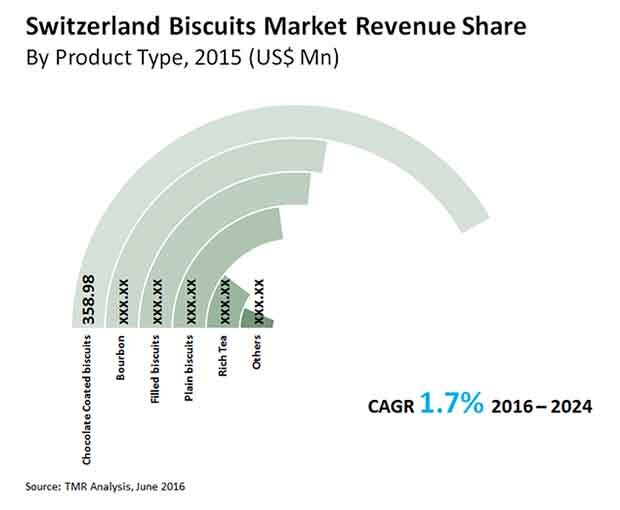 In terms of revenue, the consumer group between the ages of 20-30 years dominated the Switzerland biscuits market in 2015. This segment accounted for a nearly 28% share in the market’s revenues in 2015. The age group of 31-40 years held the second largest revenue share in the market in 2015, accounting for 23.2% of the overall market. These sectors are also expected to be the key determinants of the market’s overall development in the next few years. A vast rise in health consciousness among consumers in these age-groups is also the key reason why manufacturers have started focusing more on the production of healthy and nutritious product varieties. Over the period between 2016 and 2024, the age group of 5-10 years is expected to lead to the most promising growth opportunities for the Switzerland biscuits market. TMR estimates that the segment will expand at the fastest CAGR of 2.7% from 2016 through 2024. This estimate translates in a substantial rise in the overall consumption of product varieties such as chocolate coated and filled biscuits. In the fragmented market, some of the key vendors operating amid intense competition are Lefèvre-Utile, Walkers Shortbread Ltd, Confiserie Sprüngli AG, Kägi Söhne AG., Kambly SA, Wernli AG, Barilla G. e R. Fratelli S.p.A, Lotus Bakeries N.V., Nestle S.A., Burton’s Food, Midor AG, HUG AG, and United Biscuit.